The typical middle-income worker in Generation X, who ranges in age from 37 to 53, can expect his savings to supply 42 percent of his total income when he retires. Savings are necessary for just 27 percent of the total income of current retirees born during the Great Depression and World War II, according to one of the studies summarized by CRR and conducted by the Urban Institute and U.S. Social Security Administration. A growing reliance on savings over time will also make it harder for retirees to figure out how much of the nest egg they should spend. This complex math problem used to be less of an issue, because earlier generations more often got pension checks every month. As these negative trends persist, future retirees will be able to replace less and less of their past earnings from their working years. Compared with current retirees, early baby boomers, who are now between 63 and 72, will be able to replace 5 percent less of their earnings, a separate CRR analysis estimates. The rates are even lower – 8 percent and 9 percent less – for younger boomers (ages 53-62) and then Gen-Xers, respectively. Financial pressures are already bearing down on boomers as they move toward retirement. They have essentially three options to improve their future lot: continue working and earning money; cut fixed expenses like housing; or pull more income out of their financial and other assets. This discussion of “typical middle-income workers” seems a silly way to present aggregate data. I’m an early boomer. Does this mean that my neighbors are supposed to be sharing their pensions with me? Deciding how much of a nest egg to spend does not need to be terribly difficult. First, the IRS and actuaries have done the math for use. Use the RMD calculation for all investments. Second, protect against longevity risk (if it exists) by putting a portion of assets in an income annuity. Many like to lament the loss of employer pensions. Buying an annuity is a way to create a private pension. This is an oversimplification. However, there are ways to take the mystery out of withdrawing money from assets that should balance the need for income while avoiding running out of money. For some, the right course might be a more aggressive drawdown of assets in early retirement so that Social Security can be delayed to age 70. A guaranteed 8% a year boost can make a huge difference a few years down the road. Of course, continuing to work might be the best option to delay SS and avoid drawing down investments too rapdily. A more aggressive drawdown of assets in early retirement could involve serious sequence of returns risk. Those planning to delay Social Security might consider annuitizing that early retirement income. We’re on our own. Pensions need to return. Thanks for the great info as usual CRR. The 401(K) model has the potential to be a valuable part of retirement financial resources. The reality is that people who can contribute to a 401K do not due to financial pressure that exists in their lives today. Many of the people who do participate, do not have the knowledge to properly allocate funds to a 401K. Many are risk averse and will consequently enter retirement with a lower level of funds. What if anything will the savings be worth in USD’s? When bail-ins occur, depositor’s money has already deemed to belong to the bank. Therefore savings will have been taken. The only safety is outside the banking system in real assets. Allocation using funds isn’t complicated. The “Rich Dad” lesson I gave my Millennials was a 9-block square with large, mid and small cap stocks on one axis and growth, balanced and value funds on the other axis. Try to fill as many boxes as you can from the list of available funds. If you want to get fancy, run one 9-block square for domestic stocks and another for international. If you can’t hit all 9-boxes, give yourself some “spread” and hit at least the four corners of each square. Then re-balance at least annually. The other “lesson” is early money is big money due to time value. My daughter didn’t think it worthwhile to only put in a small amount each pay…more important to get familiar with the plan offered (nothing like having ‘skin in the game’) and learning the habit of thrift. The minimum contribution I urged is enough to max-out the full employer contribution. Last but not least, use the Roth 401k if offered especially if just getting started. The time value of money will mean much more to you later when you’ll need all the dollars (and tax-free) you can get. This should not be that difficult. You can’t put 10lbs. of potatoes in a 5 lb. bag. Track your expenses…conserve and cut back where necessary. Develop thrifty habits. When did conservatism become a dirty word. In New Jersey our taxes are so high because the taxpayers are funding government pensions and free health benefits…the extent to which they are unsustainable. The state knows this and yet they continue to raise taxes and line their pockets. Pensions are and should be a thing of the past when governments rob Peter to pay Paul. Ditto free health care. Nothing is free. Someone is paying and they have to pay for their own as well! The federal government should mandate savings. All Americans below the age of 70 with income (earned or unearned) would be required each year to set aside 10 percent of their gross income (up to $150,000) for retirement. The money would be collected via withholding, with individuals filing estimated “savings,” for that part of their income that is not subject to withholding. The money would be invested in mutual funds that index the world stock, bond, and real estate markets. The funds would be run by companies that would bid for the right to invest. There would be a five or seven person board, nominated by the President and confirmed by the Senate, that would oversee the operations. Money invested would be tax free going in and taxable going out. The funds, unlike Social Security, would be owned by the investor. At age 70 the individual could start withdrawing the funds. The cost of the program would be paid for by eliminating tax benefits for all other retirement plans (e.g., IRAs, 401ks, SEPS, etc.). Monies in those plans would remain in them and subject to the rules under which they were created but no additional funds could be placed in such accounts. The current retirement system benefits two types of individuals: (1) affluent Americans and (2) those with high savings rates. The former already get enough tax breaks and the latter will save no matter what. 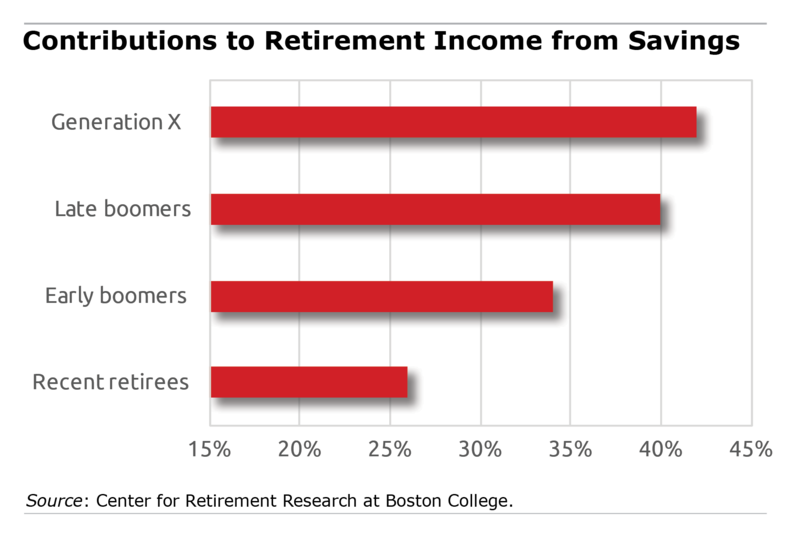 The people who truly need retirement savings are the ones least likely to participate. Your first sentence killed it all. Please keep the government out of my back pocket!!! We spend lots of time on many retirement boards discussing how pensions are a a luxury of the past and you need to start your 401k contributions young and contribute — at a minimum — up to the company max because this is free money that shouldn’t be left on the table. What we do not address is how paltry the 3% corporate contribution really is. We have assumed lots of federal debt to give huge tax cuts to the 1% and corporations only to have future cuts made to Social Security and Medicare. When are we going to demand that tax law change with regard to maximum corporate 401k contributions? Retirees with no money are going to be a huge drag on the economy. I really messed up the age ranges for the two groups of baby boomers – and an eagle-eyed reader, Scott McMullen, has pointed out my bad math! Rather than leave the incorrect and confusing ages in the blog, they have been changed in the blog to the correct ones. Thanks for reading closely Scott!